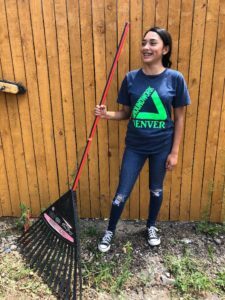 The following is a story provided by Brendan Teck, an intern holding the position of Volunteer Outreach and Communications Assistant at Groundwork Denver during the summer of 2018. Brendan Teck was selected to intern with Groundwork Denver through The Denver Foundation’s Nonprofit Internship Program. Today, we often think of young people as individuals who are unwilling or are unmotivated to go outside. We believe our children are obsessed with their phones and other electronic devices, and in general, are losing touch with the nature we were once so connected to when we were their age. 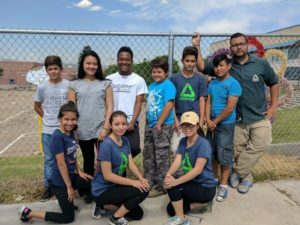 However, when I talked to David Lopez, Westwood Youth Supervisor of Groundwork Denver’s Green Team, that is anything but the narrative. Our conversation took place while walking in an alley located in a Westwood neighborhood. Most of the youth were taking a break, sitting in the shade, escaping from the sun and listening to today’s top hits, but you could tell they had been working hard all morning. When I asked David what he and his team were up to, he told me they had been working on cleaning the yard of one of the resident’s living there. The resident wasn’t at home at the time, but David was able to explain how such a simple task makes such a big impact on homes like this one. I asked David when he started working with Groundwork. “I started working with Groundwork four years ago and was hired on to recruit the youth and eventually start the first Westwood group. We partnered with Great Outdoors Colorado (GOCO), which is how we were able to pay the youth,” he said. 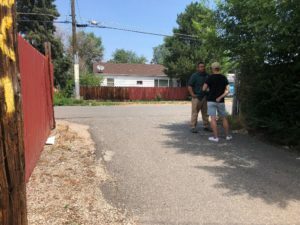 Before Groundwork Denver, David served as a youth leader when he was 16 years old, working in Adams County and helping with alcohol and drug prevention for youth. Growing up, he was able to gain his leadership and development skills through that experience. “My job is trying to get them outdoors, teach them about community and what benefits their community. I also teach them youth development and leadership skills,” David said. “Overall, what it aligns to is getting youth outdoors into nature. A lot of these youth don’t go hiking, don’t go camping, don’t go rafting – this is an opportunity to get out there, and it leads to career paths in the outdoors,” he continued. His experience and his work have led David to become a teacher. “This just allows me to work with youth and develop them, and just do what I’ve always wanted to do – have more minority youth in positions of power and leadership,” he stated. “These youths have the opportunity to become doctors, rangers for public lands and forests and just be leaders overall in their community. Groundwork allows them to do that,” he expressed. David’s impact on the youth is obvious. We asked Daisy Bantor (pictured to the right), one of his youth employees, what it was like working on the Green Team and with David. “I like it. This summer I learned how to get along with more people and talk in big groups and I like that we’re helping the environment. David is also a good supervisor. He’s caring and motivates us to get our job done,” she said. David also shared another story about another youth named Noemi Enriquez (shown in the last picture on the right). “She is actually the youth supervisor now. She started three years ago, as a shy 16-year-old. Groundwork allowed her to be out there, enhancing her public speaking skills which ultimately allowed her to be a supervisor and a great amazing person. 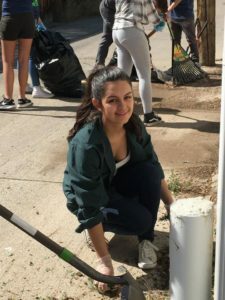 Now she wants to be in some kind of career involved with environmental science,” he shared. If you have youth who are looking to get involved, David said it is as simple as just getting outside. “A lot of the youth get scared when they hear the words ‘outdoor work’ and feel like it’s really heavy or too much. When you just get involved, they realize it might be a little hard work, but it pays off in the end,” he ended.